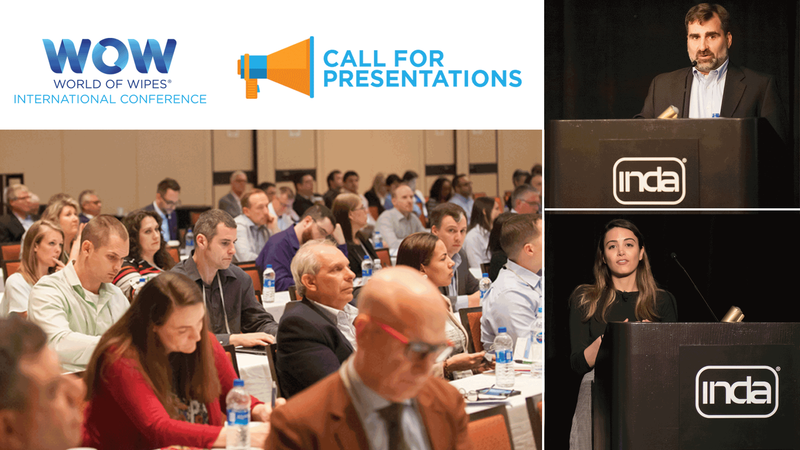 Cary, NC, Nov. 16, 2018 – INDA’s 13th annual World of Wipes® (WOW) International Conference is accepting abstracts through January 17th, on innovative, inspiring, and informative wipe products, markets and technologies for the annual event to be held next 2019 in Atlanta, GA, June 24-27. Experts in the areas of dry and wet wipes, end-use markets, substrate formation, raw materials and fibers, liquid ingredients, packaging, machinery and equipment, and market trends and data are encouraged to submit a brief abstract of one or two paragraphs detailing the relationship of their presentation to wipes or wipe manufacturing. Along with a brief abstract summary, professionals should also submit a speaker’s photo, and biography. Information should be sent to INDA Education Coordinator Deanna Lovell, dlovell@inda.org, before January 17th. Over 400 wipes business leaders are expected to convene at the Atlanta Marriott Marquis Hotel June 24-27, 2019 to hear premier relevant content concerning market research, product innovations, sustainability issues, new materials and substrates for all wiping products and their components. WOW features exceptionally relevant program content and panel discussions, the presentation of the World of Wipes Innovation Award®, evening receptions, more than 50 tabletop displays, daily continental breakfasts, and scheduled networking coffee breaks. For information about INDA’s Wipes Academy and WOW 2019, visit https://www.inda.org/education/WIPES-academy.php and https://www.worldofwipes.org/ respectively.